Moving? Let’s be honest, moving is stressful. But, imagine if you can’t read, understand all of the chatter around you and all you see is the chaos of boxes, your home in an upheaval and stressed out humans everywhere. Sounds even more stressful, right? That’s why it is vital to look after your furry friends during the moving process. Before Moving Day: Become familiar with pet rules and regulations. Landlords and homeowners’ associations may have specific pet rules. Become familiar with your new area’s leash laws, pet ordinances and/or pet licensing requirements. Your pet may need additional vaccinations, medications or certain certificates depending on where you are moving. A call to the local animal control facility should answer your questions. Talk To Your Current Vet:Your veterinarian is a great resource. If you have an animal that dislikes traveling, your vet can suggest behavior modification techniques or medication that can make traveling less stressful for your pet. When talking to your vet, also discuss getting Fluffy or Fido micro-chipped. Dr. Sara Sheltren, a veterinarian at the East Padden Animal Hospital says getting pets’ identification microchips can be a vital step in reuniting pets with their owners. Find A New Vet: Find a new vet in your new area before moving day. Your current vet may be able to make recommendations for colleagues he or she knows in your new area. When finding a new vet, it is recommended to set up an appointment as soon as you move in order to get established. It always important to make sure you are comfortable with their practice before they are needed in an emergency. Get Medical Records: Before you leave your old home, make sure you get a copy of all of your pet’s medical records to give to your new vet and be sure to find the closest emergency animal hospital and keep that phone number handy. Update Your Address: Don’t forget to have new identification tags with your new address and phone number made for your pet’s collar, and if your pet has an identification microchip, remember to update your contact information in the database. Dr. Sheltren also recommends carrying a picture of your pet with you in case they get lost. Keep Things Normal:Instead of pulling an all-nighter to pack, try to pack over a long period of time so that your pet thinks everything is normal. This will keep their stress level down. If you are moving with cats, it can help to bring out their carriers out a few a weeks before the move. Put their favorite treats and toys inside their carriers so they can get used to it before the big moving day. Don’t pack the food away! Keep your pet’s food, water, bowls, medication and any other important supplies (like that favorite squeaky toy) off the moving truck and with you. Moving Day: During the actual moving day, where boxes and furniture are being moved, pets should be removed. Find a friend who wouldn’t mind pet sitting or find a place away from all the noise of moving such as a doggy day care or cat care center. 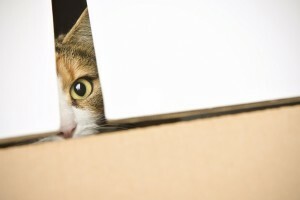 If you can visit them during a spare moment, it can help reassure the pets that nothing is going on.Keeping pets locked away in a room during moving day can make them anxious from all the noise and new people that might be in your home. If you must keep them locked away, find a quiet room, water bowl and put a HUGE sign on the door. Travel with Your Pet:Unless your move is long distance or international, your pet will likely be traveling by car with you nearby. By driving them yourself you can care for them and give them a sense of familiarity as they move. To prepare your pet for this trip, drive for short distances with your pet to prepare them before the final move. Also, remember to plan ahead for any special carriers your pets may need for transportation. There are even special seat belts for large dogs. Air Travel: If you are moving your pet by air or internationally, check all rules and regulations far ahead of the day you plan to leave and remember to keep your pet’s special documentation at hand. After Moving Day: Don’t let pets roam around the neighborhood until they are acclimated. Take them out on a leash to explore their new territory and show them how to get home. If you let them out in a new place right away, they might get lost or run away due to stress. Make sure your pet’s new identification tags are secured to their collar. Now snuggle up with your furry friend and enjoy the new home! Any questions, please call me, Chris at 914-215-2025. THE amount of goods a couple can accumulate over 44 years living in the same house can be overwhelming. And that is what Wendel and Carolyn Thompson, of Columbia, Md., have been grappling with since January as they prepare to leave their split level and move to a retirement community this month. 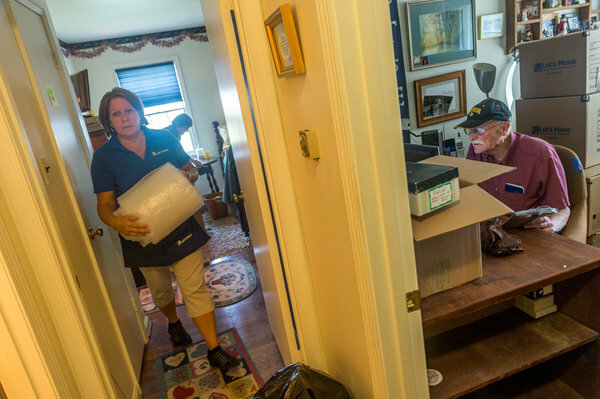 Figuring out how to squeeze the contents of a house into a two-bedroom retirement unit nearby in Catonsville, Md., has taken most of their time in recent months. And they’ve had some help. “Declutter ladies,” or downsizing specialists, spend hours with them every week to sort through and pare down their belongings to a more manageable size. “We’ll get through this. That’s what I tell myself several times every day,” said Mrs. Thompson, 77, a former teacher and Maryland school nutrition program employee, who raised three children in the four-bedroom house. An avid collector of educational materials, games, gifts and other miscellaneous items like teddy bears, she devotes time every day to deciding what goes in the boxes for giving away, the boxes for the new apartment and the boxes for each of her children — and their children. But, of course, many people do wait — and wait, said Kimberly McMahon, co-owner of Let’s Move, a downsizing and moving specialist in Fulton, Md., whose company is helping Mrs. Thompson and her husband, 78, a former government statistician, to clear out every nook and cranny. Getting rid of furniture and general clutter can be a daunting task. For those with antiques, silver, jewelry and other valuables, Laurene Sherlock, a Bethesda, Md., antiques appraiser, will advise people of outlets like vintage shops, where owners can consign their precious pieces for sale. While homeowners can amass impressive amounts, the task of clearing out apartments where people have lived for a long time is not any easier, said Ron Shuma, who runs A+ Organizing in New York City. She donated some of her art to a nearby community art center, gave some items to relatives and friends and got a lot of assistance from Mr. Shuma in getting rid of larger furniture. But with careers and young children, fewer 40- or 50-something offspring want to acquire bulkier items or take on the task of sorting and disposing of unwanted goods in their parents’ homes. In the last decade, baby boomers, more used to paying for services than their Depression-era parents, have been increasingly willing to spend money for outsiders to help them pare down their accumulation. The price of such services can vary widely, from $60 an hour in major metropolitan areas except New York City, where the cost can run as high as $200 hourly. In other areas, downsizing help can run $40 an hour. Sorting, packing and moving typically runs from $4,000 and $10,000, depending on the locale, according to specialists. Despite the cost, the demand for downsizing is strong, according to the National Association of Senior Move Managers. In 2014, the association reported that 50 percent of those contracting for services with its members were older adults, and 30 percent of the initial contacts leading to contracts were from the senior’s family. An additional 20 percent of business comes from sources like senior housing communities, which have increasingly been establishing programs to help seniors pare back and streamline their belongings before becoming community residents. In 2007, Erickson Living, a major retirement community provider, started a program in Novi, Mich., to advise older adults who had signed up to move to the Fox Run retirement community. The program, called Erickson Realty and Moving Service, is offered at the 18 Erickson retirement communities around the country, and helps older people with real estate agents, repair people, organizers and movers to smooth their path out of their longtime homes and into smaller spaces. Last year, the program helped 230 of the 340 people who moved to Erickson properties in Virginia and Maryland, said Sharon Baksa, its regional sales director. The program provides up to $2,000 in relocation expenses — sometimes more. 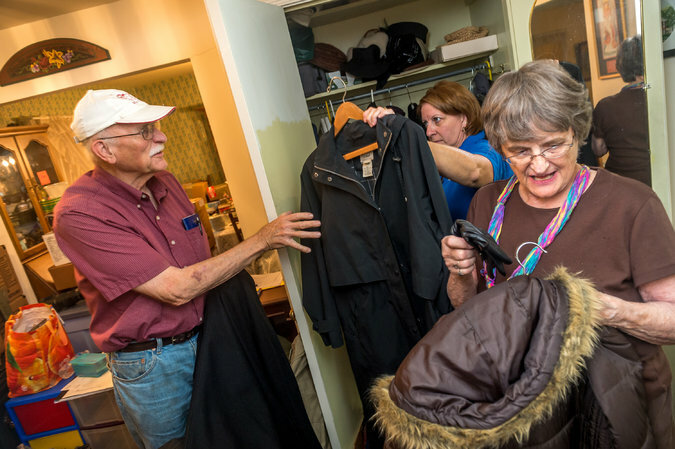 Choosing the retirement community, the Charlestown Retirement Community in Catonsville, helped the Thompsons in Maryland focus on sorting and jettisoning belongings. “When we set an August date then we knew we had a goal, and we had to meet it,” Mrs. Thompson said. The downsizing credit was an incentive for the Thompsons, who started in February with a once-a-week visit, for three to four hours, to help sort belongings and get unwanted items out the door. By April, they had increased the declutterer’s schedule to twice a week to meet their target of an August move, and preparing their house for sale by the fall. They did not have high-end valuables that would warrant an estate sale, but, instead, had one yard sale and then gave away many of their items to family, friends and charities like Goodwill and Habitat for Humanity. Most retirement communities and organizing professionals maintain a list of organizations and what they will accept. Churches or temples also help. Marc J. Rosenblum, a retired lawyer and economist, has been clearing out his late wife’s belongings and various household goods from his McLean, Va., contemporary home with advice from his synagogue, Temple Rodef Shalom. He handled the downsizing task largely on his own, but others like the Thompsons say they welcome the help and the prompting for what many see as an onerous, time-consuming job. For people thinking about beginning the task, here are some ideas from Kimberly McMahon, of Let’s Move..
■ Write some organizing time on your calendar. ■ Set a timer to get started. ■ Start small, even if it’s matching up a cup with a saucer. ■ Get a friend to help. ■ Fill a trash bag once a week. ■ Call and book a donation pickup for the next day.